The Illusion of Democracy in Parliament Square and Beyond. Anybody bothered? Earlier this month we put up a questioning post, wondering if any youth workers and/with/or young people might be seen as supporting Occupy Democracy, a week of events highlighting the illusion of democracy in modern Britain. As it is Nigel Pimlott, the Deputy CEO at Frontier Youth Trust and author of a forthcoming book, ‘Embracing the Passion : Christian Youth Work and Politics’ did turn up. His response on Facebook to the Establishment’s fear of any kind of opposition is revealing. I have found today a bit difficult. I went to the ‘Occupy Parliament’ campaign in London. I saw things I never thought possible in the UK. I witnessed the British establishment, authorise British police to prevent ordinary British people from campaigning for British democracy in that most sacred of British democratic spaces, Parliament Square, London. People were arrested (including, bizarrely, the Deputy chair of the London Assembly police and crime committee!) on some charade of an allegation about a tarpaulin being a camping tent whilst others were forcibly removed from the square. Then an 8ft high steel fence was erected around the entire grassy square: police stayed on the inside, campaigners outside. I am not anti-police but they lied today claiming the square had been closed because the grass needed repairing – despite them continue to use it as a base for their operations for the rest of the day. Farcical. The people campaigning were a mix of activists, students, middle-aged women, men in smart suits, academics, students and people like me. I saw no people who might be considered a ‘threat’, no terrorists and no anarchist drug-dealing layabouts (I use these words to paint a picture, not demonise the people). So it remains a mystery to me why this bunch of democrats are seen as such a terrifying threat to the establishment. Furthermore, I can find no reason for why the police did what they did. We cannot support with integrity democratic movements in South America, Asia, Eastern Europe, the Middle east, North Africa and, most recently Hong Kong, when we deny the most basic of freedoms to our own citizens. As many have noted, what happened today in Parliament Square, is what we criticise other countries for doing. For another view of what’s going on, see Hands off our Tarpaulin. And for the latest news of the heavy-handed anti-democratic antics, see UK Uncut’s Facebook. You’re not likely to see any coverage on mainstream supine TV. What happens when people talk about politics in Parliament Square? 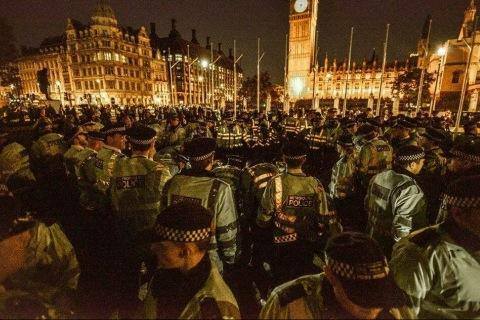 This photo was taken last night when cops tried to evict Occupy Democracy. ‘Share’ it far and wide. Well guess what? It didn’t work! People are still there, still talking about how we can build a society and economy that works for all of us, not just the super-rich. Politicians need to remember that democracy belongs to the people. We really ought to be bothered!